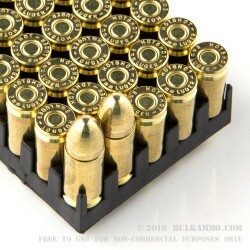 This case of 1,000 rounds in 9mm Luger is ideal for high volume target shooting. Produced in the Slovak Republic and imported to the US by Century International, these cartridges propel a 115 grain full metal jacket bullet at an above-average muzzle velocity of around 1,280 feet per second for a flatter trajectory. Each round uses non-corrosive Boxer primers and brass casings. Century International is a Florida-based importer of firearms and ammunition. The company has played a major role in making firearms and ammo from countries outside of the US and Western Europe available to American shooters, particularly AK-type rifles. Century’s other products include CZ rifles and Canik pistols from Turkey. The company also sells various shooting supplies and accessories for its imported products. Of the first box of fifty rounds, I had 3 misfires in the first 25 rounds I put through my Glock 17 Gen 3. I gave up after that. I have never had a misfire with this gun before. Never. A: Hello, Yes, these 115gr. 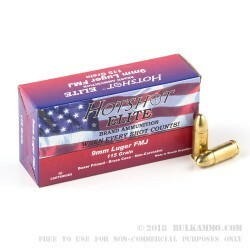 FMJ rounds by Hotshot in 9mm are reloadable. 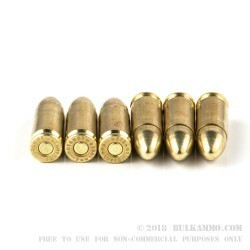 They have brass cases which are great for reloading.